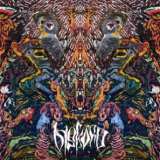 Somewhere between Darkthrone's Soulside Journey and early Atheist in sound, Norwegian death metal trio Diskord have been slaving away for fifteen years with little recognition, so it seemed only right to give new EP Oscillations a decent examination. Part of the old-school death metal movement in style, all rumbling guitars and snarled that sound exactly like they were recorded in the rehearsal room, Diskord are more than technical enough to deserve the 'tech-death' tag, and influences from everywhere from doom to black metal. It's hard to tie the band down, not least for the aforementioned Soulside Journey vibe which comes over in the gloomy atmosphere prevalent throughout. Opening with the suitably complex Horrid Engine, the black metal links are obvious from the torrential riffage poured over you. The guitar soon takes charge, barrelling along beneath drummer Hans' vocals (yep, Diskord are one of those eccentric but awesome bands with a drummer/vocalist) slowing to doom pace and really allowing the atmosphere to get its grips into you before returning to the blackened speed of before. It's a chaotic, frequently-changing track that makes a stranger sense every time you listen to it, and that vibe continues through the EP. Hermit Dream turns even darker with downright Sabbathian levels of doom at times beneath the snarled vocals, and A Downward Spire launches into the speediest, most black metal moments of the EP. Of course, as an EP this is just a taster, and 2012's Dystopics is definitely worth your time, having a more extreme variety of songwriting on show, and 2007's Doomscapes incorporating more experimentation. Still, it all adds up to a band that death metal fans should certainly not ignore, and Oscillations is a great entry point if you're new to them.